Twice-baked potatoes offer the mealy goodness of a baked potato and the smooth richness of loaded mashed potatoes. 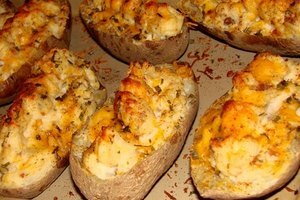 You can make twice-baked potatoes with sour cream, cheese, bacon bits, garlic, onions, or any other flavorings you desire. 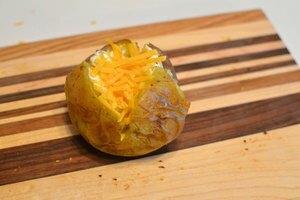 Twice-baked potatoes taste best when the flavors of the various ingredients have time to meld, so you can make a big batch, then freeze or refrigerate what you don't need right away, and reheat as necessary. Preheat your oven to 400 degrees. 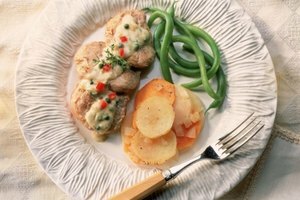 Remove your twice-baked potatoes from the refrigerator or freezer and unwrap. Place the potatoes on a cookie sheet. Brush the top of each potato half with melted butter. Heat in the oven for 20 to 25 minutes, until bubbly and golden brown. If the potatoes are frozen, heat for one hour. 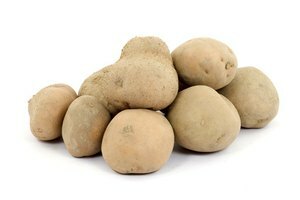 Remove the potatoes from the refrigerator or freezer and unwrap. Place on a microwave-safe plate. Brush the top of each potato half with melted butter. Slide the plate into the microwave. Microwave, uncovered, on high power for five minutes. Rearrange the potato halves to help ensure even heating. Return to the microwave and heat for another five minutes. Let sit two minutes before serving.